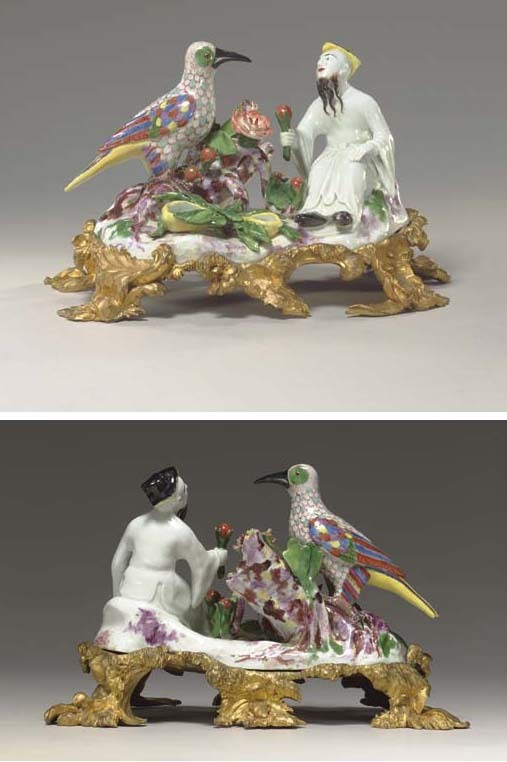 At Meissen early Chinoiserie groups like the present one, demonstrating a traditionally Oriental style, have been attributed to Georg Fritzsche, one of the earliest modellers. Examples of this particular charming group are very rare with only a few examples known. One example with a further ormolu-mounted tree emerging from the ormolu base was in The Emma Budge Collection, Hamburg, 1937, pl. 114, fig 730, formerly in the Collection of Otto and Magdalena Blohm. The collection was auctioned in the former Künstlerhaus in Berlin by Paul Graupe, 27-29 September 1937. Another version ormolu-mounted as a clock is illustrated in the Von Klemperer Collection, Catalogue, Dresden, 1928. This example is also shown in Carl Albiker, Die Meissner Porzellantiere, Berlin, 1935, Abb. 243. A second example ormolu-mounted as a clock, formerly in the private ollection of Etienne Levy, was sold as the The Property of a European Foundation, Christie's, New York, 18 October 2002, lot 315. Four unmounted examples are known: one, formerly in The Untermyer Collection -see Catalogue of the Irwin Untermyer Collection, London 1956, pl. 19, fig 24, sold Sotheby's New York, 13-15 October, lot 131 as property of the Metropolitan Museum of Art; one sold Sotheby's London, 27 November 1956, lot 148; one sold Christie's London, 28 March 1977, lot 112 and the fourth sold Christie's, London, 24 February, 1997, lot 301. In view of the existence of examples with clocks or trees emerging from the back, one should not discount this as a possibility for the present example, particularly as a square hole in the ormolu aligns with a hole in the porcelain below the tree trunk. However it is equally possible that the present example is a variant ordered by a client without the additional ornamentation, and the holes were simply used to fix the porcelain to the ormolu base. Considering that the two holes on the underside of the porcelain group are glazed and were already in place, one concludes that the factory was planning to mount this group prior to its production. The particularly richly chased rocaille ornament of the present base with its imaginative, organic interpretation of the ormolu rococo, may point to a German origin. For instance, similar mounts are found on a pair of German ormolu-mounted Meissen porcelain stag form candelabra in the Residence, Munich, illustrated in E. Bierende, 'Glanz und Pracht; Ostasiatisches Porzellan in den Reichen Zimmern der Münchner Residenz', Weltkunst, July 2002, p.1022.